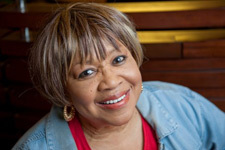 Mavis Staples grew up — alongside her father, brother and sister — traveling the Gospel Highway. 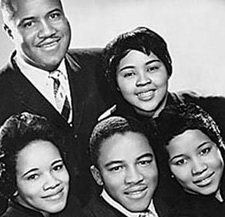 Collectively known at the Staple Singers, the family was one of the most popular groups to ever come out of the church. Her career began almost inadvertently, in 1950, after Roebuck ‘Pops’ Staples became frustrated with his own group, The Trumpet Jubilees, and their lack of commitment. After one too many missed rehearsals, he enlisted his children. In addition to traditional gospel, the Staples sourced Delta blues, folk, R&B and soul, creating a hybrid that took concepts of Biblical justice and social conscience into the hit parade. In their heyday, the group stood on the front lines of the civil rights movement with Rev Martin Luther King, and enjoyed crossover hits like ‘Respect Yourself,’ ‘I’ll Take You There’ and ‘Let’s Do It Again’ — the latter two of which hit the top of the pop charts. In all, they were together for a half century; right up until Pop’s death in 2000. His passing hit everyone hard; especially Mavis, who took time off, at one point believing she would never sing again. Encouraged by her family, she eventually returned to performing. Her solo catalogue — which began in 1969 and ran concurrent with the family’s recordings — encompasses electro-pop, soul music, disco and country. While her early records contain a number of worthy recordings, it’s in the last few years — since her return — that she’s really hit her stride, with a series of albums garnering multiple Grammy nominations in the gospel, folk, blues and pop categories. 2004’s self-financed Have A Little Faith gave notice she was back, while We’ll Never Turn Back — a collection inspired by the civil rights movement and produced by Ry Cooder — brought rave reviews. Hope At The Hideout, an incendiary live performance recorded in her hometown of Chicago, followed soon after. Fellow Chicagoan and long-time fan Jeff Tweedy was in the audience that night. Taken with what he saw, he approached Staples with an offer to produce her next CD. Tweedy — best known as the leader of Wilco — is one of the most exciting musicians on the scene today, with considerable artistic and commercial success. That alone was reason enough to warrant interest, but for Staples, the deal clincher was something else entirely: the way in which he put his family first, which resonated with her own upbringing. The two bonded over their shared sense of family. As happy as she is with the album, Mavis claims she’s even prouder to have been accepted as honorary Grandmother to Jeff and his wife’s two children. In keeping with that family-friendly philosophy, they recorded at the Wilco rehearsal loft rather than use a studio away from home. As well, the decision to stick with Staples’ touring band — augmented by a few Wilco members — was an inspired move. They play with a sense of familiarity and economy — reminiscent of the great Muscle Shoals studio band that played on many of the Staples’ best records. In addition to picking all the material, Tweedy brought in two of his own songs written especially for the project. A third; ‘In Christ There Is No East Or West,’ is credited as traditional, but Staples claims it’s actually another Tweedy original. The song is loosely based on a hymn popular with guitarists (both John Fahey and Leo Kottke recorded it), but bears the unmistakably imprint of Tweedy’s best writing, with a tangible sense of melancholy and joy intertwined. Three songs originally recorded by the Staples — all penned by Pops — are revisited; ‘Too Close (To Heaven),’ ‘Downward Road (Is Crowded)’ and ‘Don’t Knock,’ a rousing call-and-response recorded by everyone from the Kingston Trio to Tom Jones, who covered the track on his recent gospel effort, Praise and Blame. An a cappella rendition of the traditional hymn ‘Wonderful Savior’ came about under unique circumstances. Rather than using the studio proper, the track was recorded in the staircase — in the dead of winter. The majority of selections are gospel-based, but even those from completely different genres work. The entire album has a distinct sense of the heavenly; Randy Newman’s ‘Losing You,’ for instance, becomes a heartfelt tribute to her father. By any measure, You Are Not Alone is a remarkable achievement. The partnership brought the best out in both parties, and each is claiming to be looking forward to working together on a follow-up. 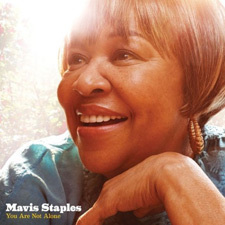 Sixty years on from her debut, and more than 40 since her first solo recordings, Staples has managed to produce music as vital as anything from her past, marking a career high at an age — 71 years old — when others are slowing down.